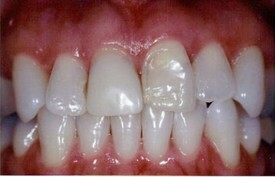 Patient's before picture shows the result of acid wear of her teeth. In this case the patient's acid wear was a result of eating too much citrus (ex.lemons) and drinking soda. Acid wear causes sensitivity because of the loss of enamel. 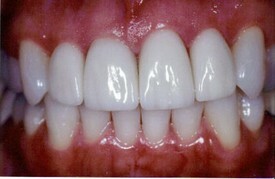 It may appear to make the teeth look transparent, discolored, and have dents on the the surface. She received porcelain veneers to restore her smile. After treatment she became more confident in the way she smiled.